Happy New Year! Where did 2018 go? Time just flies by. I made a New Year’s resolution and technically speaking, I have not broken it. However, I am giving myself the benefit of the doubt. As marketers, we should all resolve to do a few things in the new year. And unlike my personal resolution, we should attempt to make them SMART so that there is little doubt if we did them or not. What you read below is not optional. These are an essential ingredient for success as a marketer. If others are doing them and we are not, we may be putting ourselves at a disadvantage. A new year is a good time to sit back and evaluate things that you did and didn’t do. What impact did your actions have on others? What impact did your marketing materials have on prospects and customers? What initiatives seemed to work and didn’t work? An important question I ask is, “What are some things people suggested I do that I virtually ignored because either I thought they were not valuable or convinced myself that I was too busy.” For example, I know I need to dial back on my cold e-mails and start attending more events to meet people and build relationships. I also need to develop more useful content for my prospects so I am seen as someone who knows a thing or two and entices them to work with me. I also need to re-read my e-mails before hurriedly sending them out which sometimes leave people scratching their heads as to what they mean. My e-mails have to be concise, worded well, and should not have any obvious spelling or grammatical errors. Many things happen in one year. Old foes depart, new competitors spring up, customers’ perceptions about your brand change, your sales team shrinks, or your drug gets added to the formulary. It is a good idea to determine if you took appropriate steps to learn how the landscape may be different now and if you made adjustments to your new reality. Sometimes we don’t see the forest for the trees. We are just too involved in day-to-day minutiae that we fail to see the big picture. We need to step back and take some time to evaluate if our marketing efforts are properly aligned with the needs and desires of our customers. Market awareness is not optional. I am trying to sell my house. Every day I get data from Zillow on the number of views of my property and few times a week a full marketing report from my real-estate agent. I used to read these religiously but slowly I became more and more lackadaisical. It became a bit depressing when I realized there was not much I can do about it. But there is always something we can do about it and it needs to be done. As marketers, we may get data on so many things; number of page views and unique site visitors, conversions on pay-per-click campaigns, performance of keywords, which physicians are prescribing our drugs more or less, sales figures, number of people signing up for our newsletter etc. We cannot ignore this information. Based on what we learn, we need to act on it. We may need to refresh our website, create new content, or alter our marketing mix. What was the last time you met with a district sales manager or even a sales representative selling your product. No, I am not saying VP of Sales who may spend most of his time sitting in his office. I mean a person who interacts with your customers and talks about the relevance of your product on a daily basis. A person who is a primary contact with buyers and hears first-hand their experiences with your product. And I think a telephone call is a poor substitute for a face-to-face meeting and e-mails don’t count. I want to look into their eyes and see their body language as they tell me what is going on in the field. I want to hear the good, the bad, and the ugly straight from the horse’s mouth. I want to find out if they are being supported well by the marketing team in terms of detail pieces, clinical data, messaging, and training. Are they happy with the metrics being used for evaluating their performance? Do they have what they need to do their jobs well? It is always surprising to me the number of times I see a disconnect between sales and marketing. I was a pharmaceutical sales rep for six years and finished in top 1% three of those years. One year, I was selling a sleep aid drug made by a large pharmaceutical company. For two straight quarters, not one sales team met their quota. In one meeting, the product manager stopped by and started berating us for not meeting our goals. I raised my hand and asked him how many people are in his product marketing team? He told some number in single digits, let’s say eight. I asked him why he thinks that eight people are right and 500+ sales reps are wrong? Could it be that marketing set over-inflated goals which were not realistic or attainable because there are two parts to meeting goals, one is setting them and one is attaining them? He was basically dumbfounded and could not come up with a coherent answer. For that one day, I was the most popular sales rep on the team. The daily grind sometimes does not allow us to set aside some time to learn an important job-related skill, but we need to resolve to keep improving our skill-set. For many marketers, it could be becoming more comfortable with social media, learning how to do a drip campaign, or figuring out which initiatives are giving us the highest return on investment. These may already be a part of your tool-kit, so pick something else and become proficient in it. I don’t have to explain this one, but I will say one thing. I recently read that the proper number of French fries to eat is six. And please don’t make huge french fries. As marketers we should start the new year with a bang. Make sure we are doing the right things and doing things right. 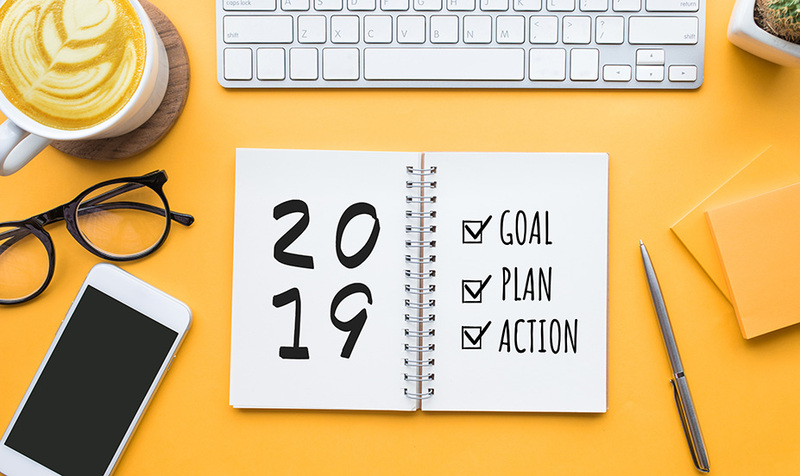 I’d love to hear what marketing resolutions you are going to make in 2019.